With its intriguing combination of Victorian romance and industrial chic, it's no surprise that the Steampunk movement has found its way into everyday fashion. From full Steampunk-inspired outfits to cool accessories and details, there are lots of ways to incorporate this fantastic style into your wardrobe. If you want to add some Victorian industrial style to your look, you have lots of options. Try a women's jacket with clasps, such as the Chic Star Women's Tuxedo Jacket with Tails from Atomic Cherry. This slim-fitting cotton spandex jacket features six buttons and is fully lined. You can pair it with a full skirt and corset for a complete Steampunk outfit or simply wear it with jeans for a more subtle look. It comes in sizes 8 through 24 and retails for about $75. 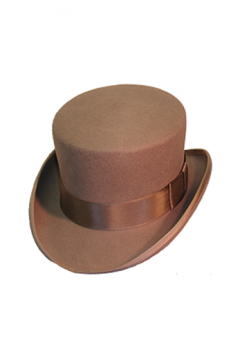 Add a good quality top hat like the Low Top Hat (pictured) from HatCrafters.com. This classic shape comes in black, gray, brown, and tan and fits head sizes between 6 7/8 and 7 7/8. It would look great with a full costume or as a decidedly Victorian accessory with your regular clothing. It retails for just under $80. Make a tuxedo shirt part of your look to incorporate Victorian menswear in a subtle way. The Tuxedo Shirt from J. Crew is a great option because the sheer fabric is feminine and flirty while the cut is masculine. It comes in sizes 00 through 16 and retails for just under $90. Add a Steampunk vibe to your look with a great jacket, like the Key Jacket from Rebel Market. Crafted in faux leather and featuring details like tails and metalwork embellishments, this slim jacket has a Victorian feel. Wear it with anything from a ruffled shirt to a simple tank top. It comes in sizes S through XL and retails for about $100. Incorporate a leather bustier or corset, which you can wear over a blouse or knit shirt or on its own. The Shaper Corset Real Leather Overbust Bustier (pictured) from Amazon.com is an ideal choice. You can pair it with jeans and a jacket or rock a bustle skirt and laced boots. It features steel boning and a comfortable cotton lining. It comes in sizes 34 through 56 and retails for about $130. Try a horizontal stripe in the form of a jacket, such as the Tess Striped Moto Jacket from BCBG. The leather jacket has asymmetrical epaulettes and hardware that make it modern as well as Victorian. It would look great with black capris or a white corset paired with a long skirt. It comes in sizes small, medium, and large and retails for just under $1200. A skirt is another great way to incorporate high-contrast stripes, especially when you choose a full style. The Striped Skirt from Zara is a mid-length design that would look beautiful with a tuxedo jacket and cross-laced booties. It comes in sizes small, medium, and large and retails for about $20. You can also use clockwork prints in a more casual, affordable way. The Steampunk Dragon Layered Top is a cute option that's ideal for showing a little Steampunk style. The neckline and sleeves feature lace that is light and pretty and is the perfect complement to the graphic of the shirt. The graphic shows a dragon that is made of gears in front of a larger clockwork gear. It comes in small and retails for just under $30. A corset with industrial-style clasps is an ideal choice, whether you wear it with modern jeans or a full Steampunk costume. 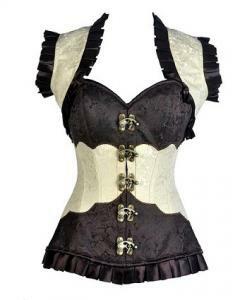 The white and black Steampunk Corset (pictured) from Amazon.com is available in a luxurious brocade fabric, quality steel boning, and cool clasp hardware. It also features a modesty panel in the back. It comes in size 22 and retails for about $60. A high-low hemline is an easy way to update a bustle skirt, and this means you can wear it with a full costume or with your favorite knit top. The Lorena Skirt from Ladies Emporium is a good option. The subtle gray stripe, flounces, and bustle are full of Victorian charm, and the higher front hem is fun and contemporary. It comes in sizes small through 3X and retails for about $80. The great thing about Steampunk-inspired fashion is that you can opt for a lot of Victorian futuristic details or just a few key elements. Either way, your look will be unique, beautiful, and of-the-moment.